Harpoon is a minor but deadly enemy of the X-Men. 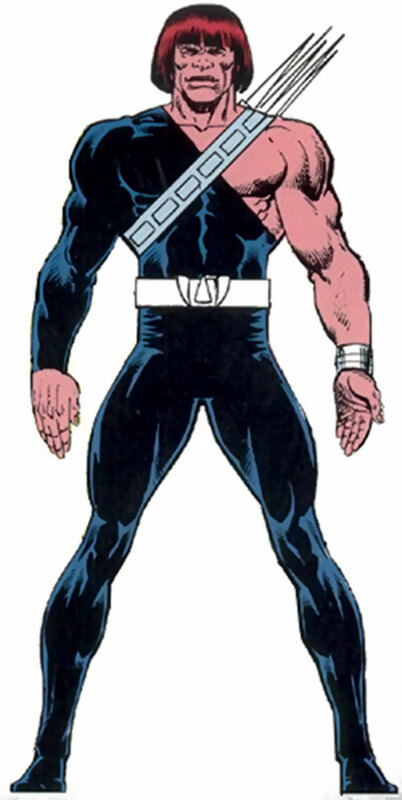 Like most members of his team, the Marauders, he appeared in 1986 during the Mutant Massacre storyline. 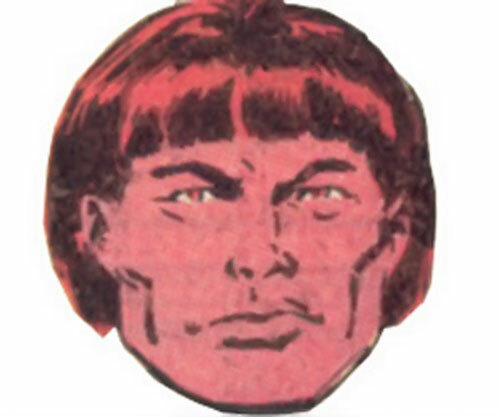 These are older (1990s) notes about him, so the focus back then was on modelling his redoubtable power in DC Heroes RPG terms. Beside, there wasn’t much of a character to describe back then. 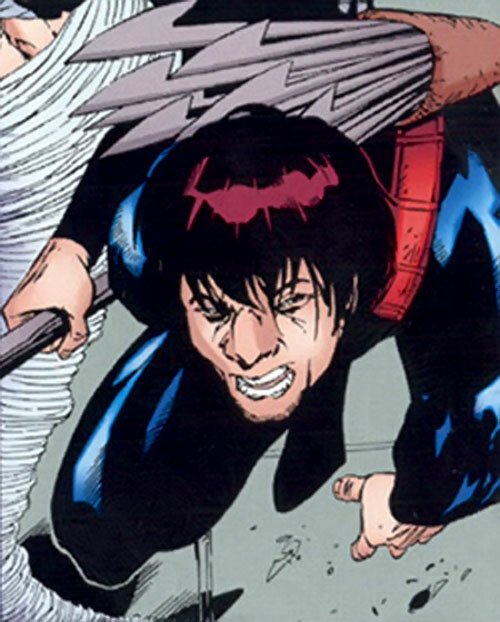 Harpoon is a mutant with the deadly ability to charge any object with various types of energy. He uses this ability to charge and then throw “slayspears” – harpoons – onto (or rather through) his opponents. In DC Heroes RPG terms, he has the options of merely charging the spears (EV, Lightning, Sharpness) or to fully convert them into energy (Energy Blast, Disintegration). The energy types available are many. He does all the manipulations with the speed of a real master ; he’s had to have many years of practice before joining Sinister. As an experienced hunter he’s extremely strong and very fast, handles his slayspears near perfectly, tracks most preys and is stealthy. This psychopath doesn’t, of course, get scared. He often ignoress his self-preservation instincts in order to charge right onto the most dangerous opponents. Harpoon is basically a sniper and uses Blindside tactics whenever possible to kill the victim in one attack. In game terms, he uses Stealth to approach the victim and then charges/throws his weapon, spending Hero Points on the attack vs. tough opponents. Naturally, he attacks with the energy type that a victim has a vulnerability against, if he knows what it is. The normal power combination of Energy Blast and Disintegration is most effective against low-level opponents. Harpoon saves the EV/Lightning/Sharpness combo for more powerful opponents. Harpoon is a young Inuit. 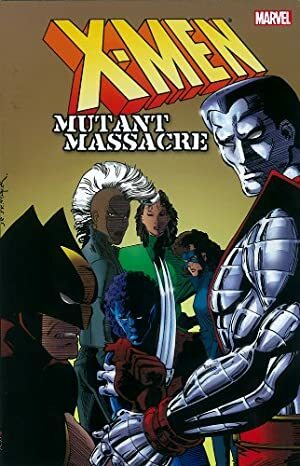 He hadn’t been outside his native community before coming to New York with Mr. Sinister’s Marauders. Harpoon participated in the Morlock Massacre with the rest of the Marauders. He is the man (together with Blockbuster and Vertigo) who’s responsible for the Archangel losing his natural wings. 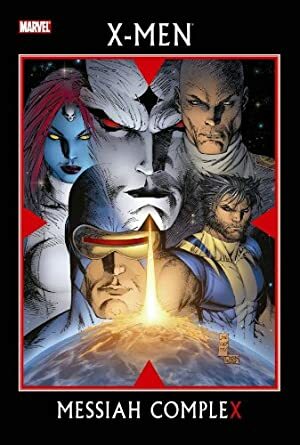 In the tunnels he clashed with some members of the X-Men. He was also present in the first attack against the thunder god Thor in the same tunnels, but fled once he realized the power his opponent wielded. This was probably a very wise choice since his pal Blockbuster later alone returned to Thor only to get killed by him. He’s a regular member of the Marauders still active along teammates Arclight, Malice, Scalphunter and Scrambler. Like the rest of the Marauders the current Harpoon is a clone of the original. Harpoon is a strong-looking Inuit man. He wears a full-body protective costume that only leaves his left arm and head bare (typical Marauder costume style). The costume is purple in color. He also wears a pack of metal “slayspears” on his back in a quiver which extends as a band around his chest. Harpoon also wears a metal belt. He has red, straight cut hair and very dark eyebrows. He’s very often seen around with a nasty smile on his face and a slayspear in his hand. Harpoon is a cold-blooded killer. It’s clear that he really, really enjoys the killing and pain of others in a sick, psychopathic and sadistic way. He’s a very cruel man, but actually is a good pal of teammates Sabretooth and Blockbuster, who both share his brutality. The other members are often getting snide remarks from him although he’s still a very good team player. Harpoon is always at the front of the attacking team; in fact, many opponents are impaled by a slayspear in the first surprise attacks. Harpoon is so vicious that he often spends HPs on his Energy Blast to make it even more deadly. Since he’s a young Inuit in his 20s from a very small community, everything about New York impresses him. Additionally he appears to be slightly scared of the superstitious and quickly fled once he realized what Thor was. Lightning Reflexes, Misc. Advantage (see Below). Marauders (High), Mr. Sinister (Low). ARMOR [/BODY/ 06, Note: Armor is Partial (-2CS to bypass)]. Slayspears (x20) [BODY 08, EV 04 (06/w STR in melee), Notes: The slayspears, weighing -3 APs, often carry either a quickly-placed charge of the Energy Blast/Disintegration combo of 9 APs each, or thrown EV, followed by the Lightning Power at 9 APs (Sharpness is often used with this attack). Each extra round of charging, beyond the first, increases the charge of Lightning by +1 up to a maximum of 13 APs. OTOH, for the combo attack, if Energy Blast is successful, it is followed by his Disintegration power. See below for the details. Lightning can be combined with EV.]. Harpoon has the mutant ability to charge his slayspears (and possibly other objects) with lethal energy (EV, followed by Lightning and Sharpness) or to convert the slayspear completely into energy (no EV from the spear, but a Energy Blast, that, if successful, is followed by Disintegration upon impact) – this is the Charge Object Bonus (+2 to all three Powers) and Combined Power Usage Bonus to the pairs Energy Blast and Disintegration (+2) and Harpoon EV, Sharpness and Lightning (+3). Combined Power Bonus, for Harpoon, completely replaces the normal Charge Object rules, regarding APs and BODY, as presented in the rulebook. Harpoon cannot use his energy powers without an object to charge – he cannot blast at opponents, for instance (-2). The Energy Blast/Disintegration combo is used against opponents with low physical RVs, while the EV/Lightning/Sharpness combo is used against opponents with high physical Rvs. Charging an object is an Automatic Action regardless of the object being charged. However, only very large objects can carry the full Lightning charge (-2). Objects weighing -3 APs, such as his Slayspears, can only carry a charge of 09 APs of attack power. Large objects can carry a larger charge the heavier they are (Lightning is increased by +1 AP for each AP of object weight above -3 APs, and hence weight + 12 APs is used, up to a maximum of 18 APs, including APs from extra charging time. Furthermore, there is a delay to his charging of objects (-1); the object carries more energy the longer it is charged (Lightning starts at 9 APs for his Slayspears, the first round, and is increased by +1 AP for every extra round, up to a maximum of 4 extra rounds, that he spends charging the slayspear (results in +4 APs of EV). To summarize, Harpoon may choose to merely charge the weapon with energy or convert the entire weapon into energy. This energy might be electricity-, radiation- or electromagnetic based (Energy Blast) (+0). Upon impact, a victim is attacked simultaneously by the thrown edged metal weapon (EV, Lightning, Sharpness) or by a slayspear completely converted to energy (Energy Blast and Disintegration). Damage from all charged attacks are applied in arrays; a victim is first attacked by the cutting metal weapon (EV; the main power), then by the charged energy (Lightning), calculated by using Sharpness. If fully converted, the array is instead Energy Blast, followed by Disintegration. The attacks are resolved as to standard multi-attack rules handling Combined Power usage boni, resulting in only one Dice Action for the entire attack series, such as those of a flash-bang stun grenade with several modes of attack. All of Harpoon’s energy attacks have a disastrous and unique side-effect. Any Character reduced to negative BODY by Harpoon’s slayspear attacks will, if he survives, enter a Power Complication Subplot (25 HPs Advantage). Helper(s): Sébastien Andrivet, John Colagioia, Roy Cowan.